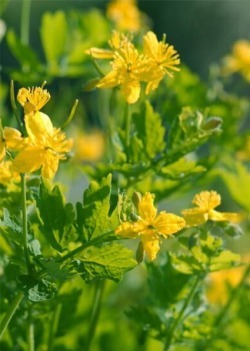 Other common names: Chelidonium, garden celandine, greater celandine, tetter-wort, killwart, wart flower, wartweed, wartwort, felonwort, cockfoot. devil's-milk, Jacob's ladder, swallow-wort, wretweed. Habitat and range: Celandine, naturalized from Europe, is found in rich damp soil along fences and roadsides near towns from Maine to Ontario and southward. It is common from southern Maine to Pennsylvania. Description: This plant, which has rather weak, brittle stems arising from a reddish-brown, branching root, is a biennial belonging to the poppy family (Papaveraceae) and, like other members of this family, contains an acrid juice, which in this species is colored yellow. It is an erect, branched, sparingly hairy herb, from about 1 to 2 feet in height with thin leaves 4 to 8 inches in length. The leaves, which are lyre shaped in outline, are deeply and variously cleft, the lobes thus formed being oval, blunt, and wavy or round toothed, or rather deeply cut. They have a grayish-green appearance, especially on the lower surface. The small, 4-petaled, sulphur-yellow flowers of the celandine are produced from about April to September, followed by smooth, long, pod-shaped capsules crowned with the persistent style and stigma and containing numerous seeds. Collection, prices, and uses: The entire plant, which was official in the United States Pharmacopoeia for 1890, is used. It should be collected when the herb is in flower. At present it brings about 6 or 8 cents a pound. The fresh plant has an unpleasant, acrid odor when bruised, but in the dried state it is odorless. It has a persistent acrid and somewhat salty taste. Celandine is an old remedy. It has cathartic and diuretic properties, promotes perspiration, and has been used as an- expectorant. The juice has been employed externally for warts, corns, and some forms of skin diseases.